To kill boredom, people are getting trivia fanatic especially ones who love to enhance their knowledge. Trivia Android apps are almost everyone’s favorite and Android trivia apps are increasing on Play store. A lot of options in trivia Android games enable the user to feel unique and bold. Android trivia apps are trendy and user-friendly. They let user compete and share their results with friends and family. So instead of spoiling the rewarding opportunities, try out your luck with trivia apps. Want to try out some quiz, logical and trivia questions? 94% is the best quiz game that is fun and enables the user to guess answers 94% to the given trivia questions. A user must guess 94% answer which will fit best with the given scenario. The best trivia app contains many questions that vary according to the level and category. The game offers fun levels. 94% keeps on updating by the developers with new amazing questions. Trivia 360 is the new quiz game that is exceptionally designed for the users in a traditional way. The game consists of many riddles, true and false questions, and questions about various categories. The leaderboards enable the user to compete with friends and family by sharing scores. Thus, the interface of the game is simple, easy to learn, colorful and user-friendly. Remember that the landmark questions are only US based. You have to deal with ads and there is no other way to avoid ads. Trivia Android app free download link is available here. One of the popular trivia Android games is trivia Crack that is available for free and with in-app purchases online. The amazing app is packed with great questions and best content. Hundreds of questions are available on Trivia app Android and users have the option to create own riddles as well. However, you can title Trivia Crack as a social game because it lets user challenge friends or connects with random people online for unlimited fun. Even paid version of Trivia Crack offers in-app purchases and will definitely remove ads. So enjoy answering questions. Best trivia Android app download link is here. The free Android trivia app is a sequel to Trivia Crack that offers great quiz games and allows a user to challenge their friends and family by testing the knowledge. Get to know who is smartest amongst all with Trivia Crack Kingdoms. The game is filled with fun and enables the user to get useful information. Trivia Crack Kingdoms is available for free online and offers a fantastic play with cute characters. The game content never gets old because of continuous update by the developers. 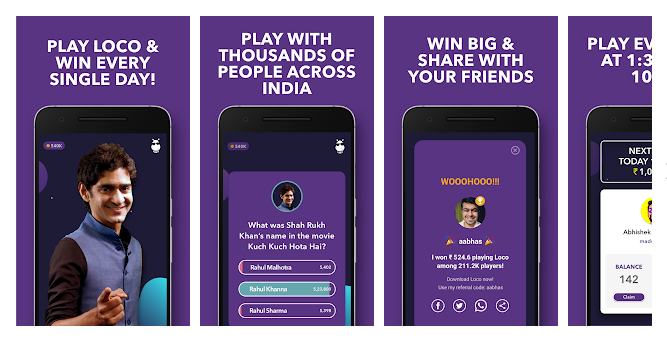 Loco Live Trivia Android app is the first live game for Android phones. Players can log in systematically at1:30 pm to 10 pm every day to win cash prize after answering 10 questions. A cash prize is shared among winners equally after answering correctly otherwise you will end up with nothing. The game provides a real-time feeling as if players have actually participated in the show. The concept is unique and grabs attention. All of the best trivia Android apps are mentioned above. Do not forget to mention your favorite trivia game app below in comments. Stay tuned for updated articles.